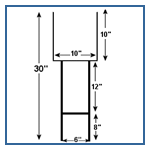 Heavy Duty Sign Stakes - For Yard Signs - New Lower Price. Heavy duty - long lasting performance. For corrugated plastic yard signs. Heavy duty sign stand will display your yard sign approximately 12 inches off the ground. Stake is 30 inches high, top sign mounting prongs are 10 inches wide, base (ground prongs) is 6 inches wide. These sign wires are the strongest wire frame, in the industry. Corrugated plastic signs are easy to display with these sign stakes. Simply mount the sign on the stake than put the sign stake into the ground. No mounting hardware needed.